The packed house last night at the 9:30 Club attested to the faithfulness of Drive-By Truckers' fan base. 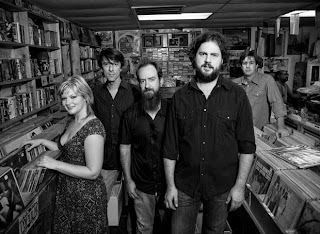 With leader Patterson Hood (pictured, second from right) out with walking pneumonia, second fiddle Mike Cooley (second from left) led the two-and-a-half-hour show through DBTs' more country, less punky catalogue. Considering this was the first time I'd seen Alabama's modern-day answer to Lynyrd Skynyrd, they offered a romping good time and Rachel and I couldn't really tell what we were missing without Hood. Even Peter, who's a true Truckerhead and has seen them many times, agreed it was well worth the $25 admission. The Washington Post reviews both D.C. weekend shows.